Well, isn’t this a surprise? I’m actually posting something. 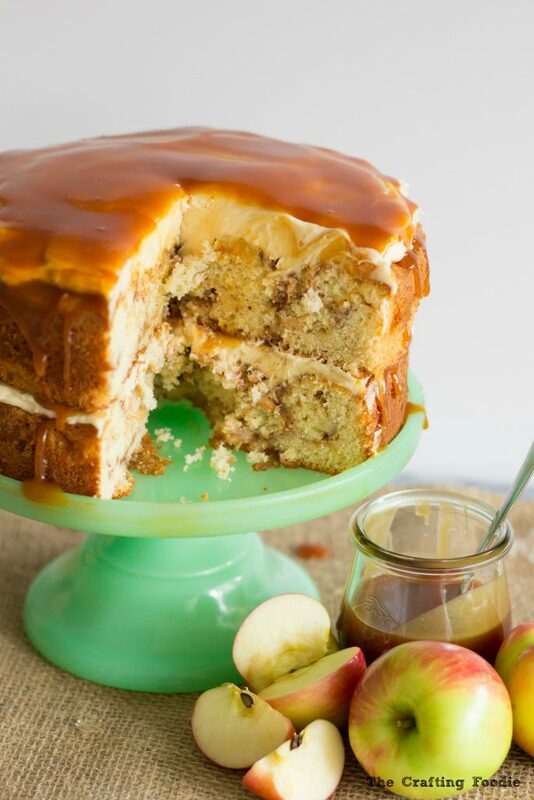 Yeah, and it’s this Salted Caramel Apple Cake to be exact. Wowzers…. Yes. It’s been a long while. Here’s the deal, I started blogging because I wanted to share my love for all things creative: baking, knitting, cooking, crafting, and now sewing (!). But after getting caught up in the number of posts I published a week. And how many Facebook likes I got. And how many page hits the post got. I lost sight of why I even started blogging in the first place. Then this insane, demoralizing presidential campaign started. I got so down and disgusted by EVERYTHING. So much negativity spewed all over everything. And honestly, it’s still going on. Even thought the nightmare campaign is over, there’s still so much division and hate. While I can’t control what’s going on around me, I’m choosing light over darkness. Tolerance over division. And love over hate. I’m not here to blame anyone. Or to make anyone feel bad or guilty. I’m here to appreciate all the goodness in the world. All of the kindness. All of the love. And there’s one simple reason I started blogging again: happiness. 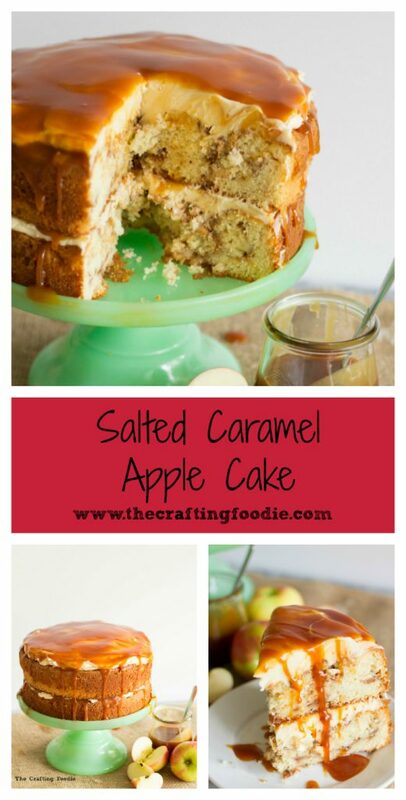 Sharing whatever it is that I create with my readers truly brings me happiness (just like this Salted Caramel Apple Cake brought happiness to those who gobbled it down). And through the magic of the internet, I hope my creations can brighten your day – even in the smallest possible way. 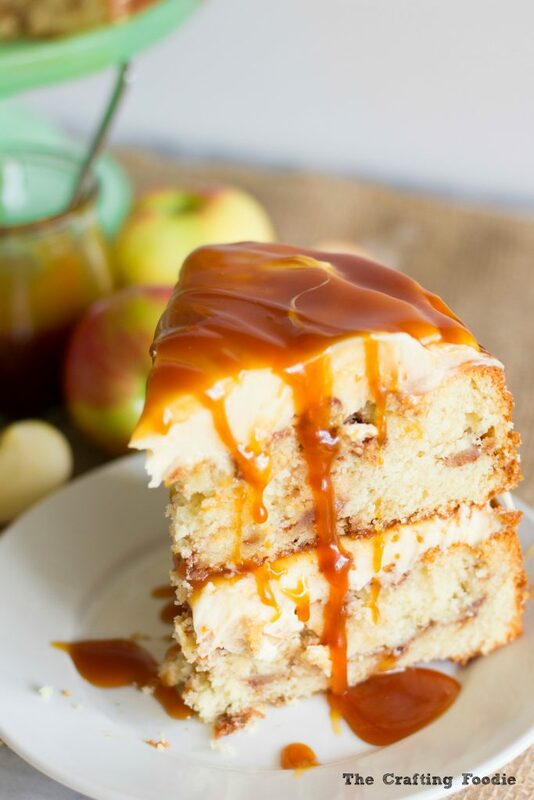 Three layers of the fluffiest, buttery cake swirled with cinnamon sugar, layered with crisp apples and salted caramel, and topped with a luxuriously smooth salted caramel frosting. Add the sugar to a heavy-bottomed saucepan. Remove the pan from heat, and add the butter. Allow it to melt. Prepare 2, 8-inch cake pans by lining them with parchment paper and greasing the bottoms and sides of the pan with butter or cooking spray. In a small bowl, mix the brown sugar and cinnamon together. Set it aside. In a medium bowl, sift the flour, baking powder, and salt together. Set aside. Measure out the milk, and add the vanilla. Set aside. In the bowl of a standing mixer fitted with a paddle attachment, beat the butter and granulated sugar until fluffy. Add the eggs, one at a time. Mix until just combined. Then add the flour mixture alternating with the milk mixture in three additions. Start and finish with the flour mixture. Mix until just combined. To fill the cake pans, start by adding ¼ of the cake batter in the bottom of one pan. 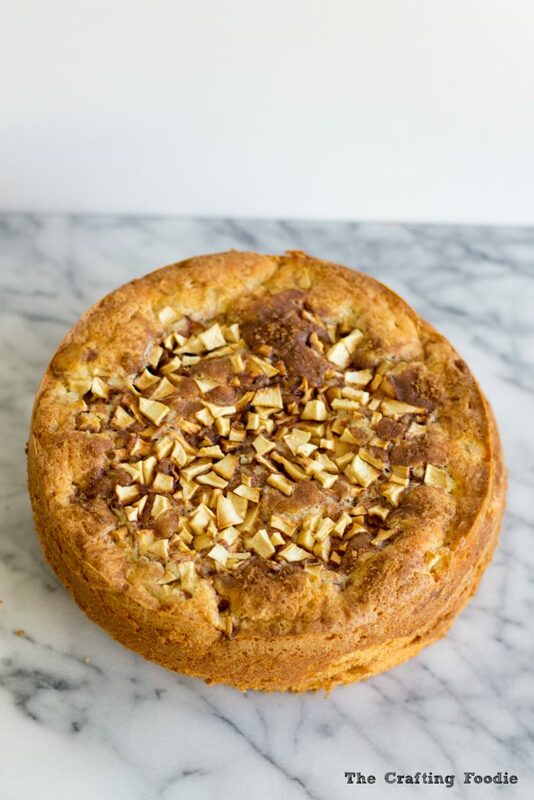 Then place ¼ of the chopped apples and ¼ of the cinnamon sugar on top of the cake batter. Pat the apples down into the pan. Add another ¼ of the cake batter on top of the apples. Followed by another ¼ of the chopped apples and ¼ of the cinnamon sugar. Again, pat the apples down into the cake batter. Follow the same steps to fill the second pan. Place the pans in the oven for 35 to 40 minutes. Once baked, place the cakes (in their pans) on a cooling rack for about 15 minutes. Then turn the cakes out of the pans, and allow them to cool completely on the wire racks. In the bowl of a mixer fitted with a paddle attachment, beat the butter and sugar until light and fluffy. Add the vanilla and salt. Mix until just combined. Add the milk/cream and beat until fluffy. Add the salted caramel, and mix until combined. Place a layer of frosting on top of the first layer of cake. Then add 3-4 tbs of salted caramel. Place the next layer on top. 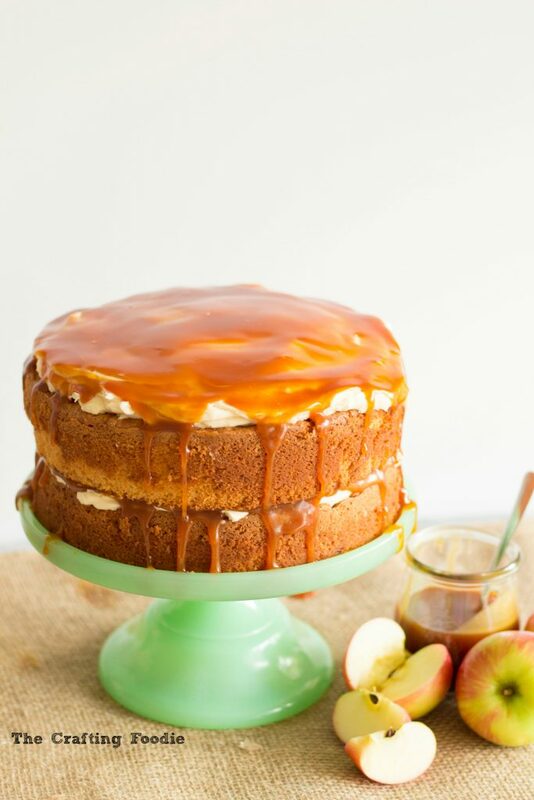 Frost the top and cover with salted caramel. This looks so yummy, I would go wonderfully with my coffee! 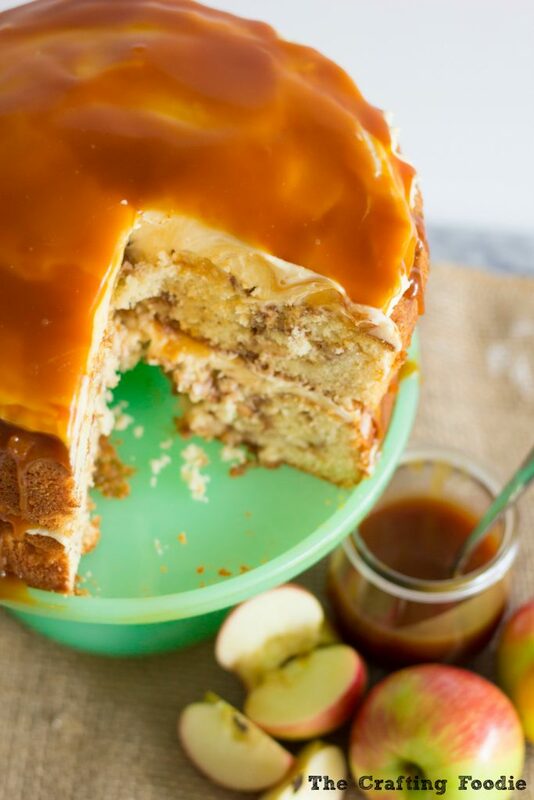 that frosting and glaze… omg! Thanks, Nicole! 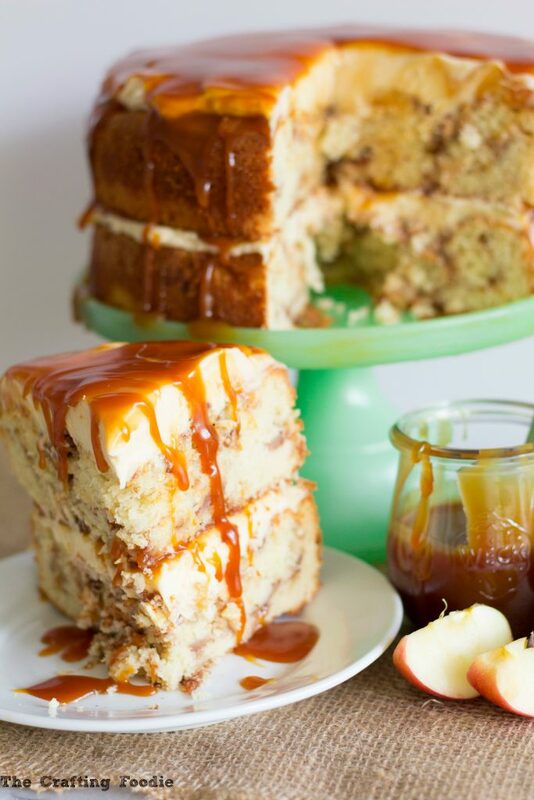 That caramel is so good – and it’s so easy to make!